We are to part of three of my five day fall camping destination series. First up was Vermont. Yesterday was Michigan. Today we're heading to the southern part of the United States, North Carolina. 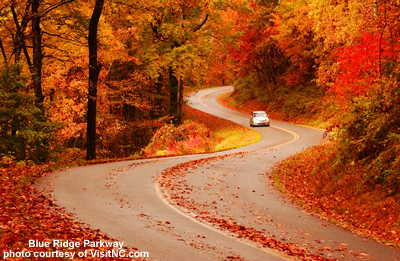 If you are a fan of taking scenic drives in the Fall, then a trip along the Blue Ridge Parkway is a must. It is a 469 mile road that connects the Shenandoah National Park in Virginia to the Smoky Mountains National Park in North Carolina with 250 miles of the parkway located in North Carolina. Yes, I know it is a long drive and gas prices are sky high, but it isn't necessary to travel the entire distance to see great views, but if you do plan to traverse the entire parkway the NSBP (National Scenic Byways Program - sponsored by the U.S. Department of Transportation) recommends allowing 4 days. The Blue Ridge Parkway is called "America's Favorite Drive" and has been designated as an "All-American Road" because of its scenic beauty. It is an extremely popular fall destination because of its stunning fall foliage. Construction of the parkway started in the 1930's and took over 50 years to complete. 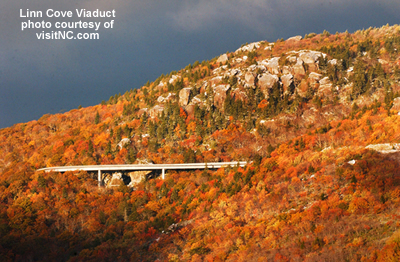 It was finished in 1987 when the last stretch of road around Grandfather Mountain was completed. Because the parkway goes through mountainous areas it is susceptible to periodic closures from storm damage. Always check on the National Park Service's road closures website page to see if there are current closures on the Parkway; or call the park information line at 828.298.0398. In addition to listing the current closures, the website provides detour information (as of 9/22/08 milepost 367.7 to 355.3 and milepost 285.5 to 291.8 in North Carolina along with milepost 105.8 to 112.2 in Virginia are temporarily closed). Sadly I have not personally driven the Blue Ridge Parkway or camped in the area yet, but it is definitely a trip I plan to enjoy within the next couple of years. But even if you are not familiar with the area, there is tons of information available to help "newbies" plan a great trip and maybe even help seasoned travelers of the area find a new thing or two to check out. 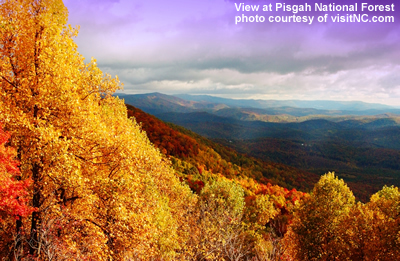 There are nine campgrounds on the parkway that are open early May through the end of the fall color season. Camping is $16 a night for all campgrounds. For a list of all nine campgrounds, along with their location and reservation information click here to go to the National Park Service (NPS) website. BlueRidgeParkway.org also has information about the nine campgrounds. Julian Price is the largest campground along the parkway with 129 tent sites and 68 RV sites. It is near Boone, North Carolina and is adjacent to Price Lake. Mount Pisgah Campground is at milepost 408 near Asheville, North Carolina. It has 70 tent sites and 70 rv sites. It is the most secluded campground on the parkway and also the highest with an elevation of 4980 feet so the views are spectacular. Keep in mind though that its high elevation mean that temperatures are usually moderate to cool during camping season (don't forget to pack your long underwear, cozy sweatshirts and warm socks!). For a list of 60 things to see and explore along and near the parkway (that should keep you busy for a while! ), go to BlueRidgeParkway.info. The list is sorted by milepost number (for example, Linn Cove Viaduct is on the list at milepost 304.4) and has a handy key that lists available resources at each one such as G for gasoline, H for hiking, C for camping, F for food (all that sightseeing and exploring is going to make a person hungry) and FEE - fee charged. 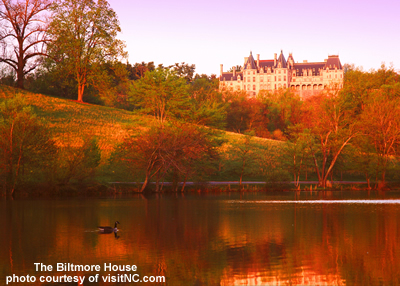 And for one more suggestion, how about taking a trip back in time and to a place where money was no object - the historic Biltmore Estate. It's near Asheville, North Carolina and is only 4 miles from the Blue Ridge Parkway (take the U.S. Highway 25 north exit). 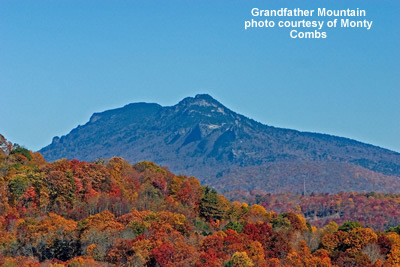 To stay up to date on when and where color is at its best along the Blue Ridge Parkway in North Carolina or anywhere else in the state, check out VisitNC.com's fall foliage reports or call them at 1-800-VISIT NC (1.800.847.4862). If you're still not sure whether or not you want to grab your camping gear and head to North Carolina, check out this great photo slide show of some of the sights along and near the Blue Ridge Parkway in North Carolina to see for yourself "what all the fuss is about."